Pothole City!! The two words that come to mind every time I hear or see this waterfall mentioned. Potholes are round shaped holes sometimes seen on streams that have rapid or turbulent water flowing over exposed bedrock. 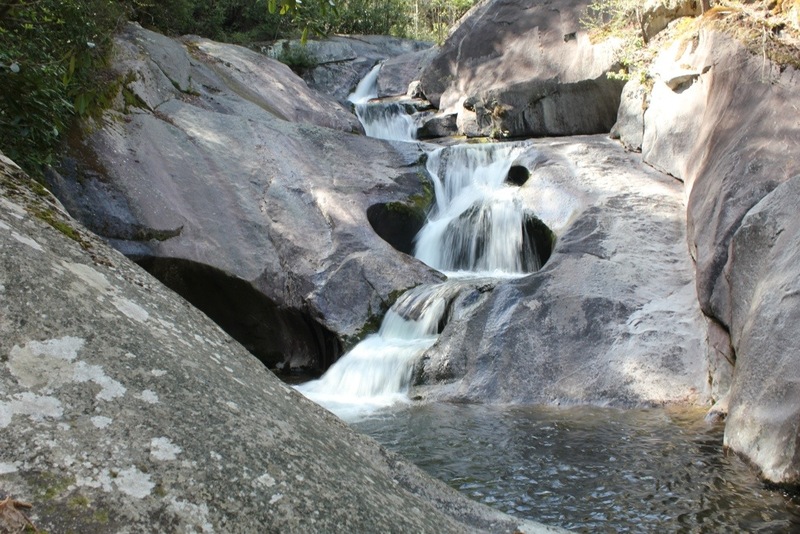 Over time, sediment collected at the bottom of the pools, or smaller rocks and soil, use the force of the rapidly moving water to “grind” these holes in the rock. This is one of those waterfalls that just doesn’t get mentioned much. It is a really special one, but accessibility is tricky. Getting there requires a 4 mile drive up, down, around a very narrow forest 228 road. Traveling north from Morganton, it is about 15 miles north of where the 4 lanes on NC 181 turn to 2 lanes. 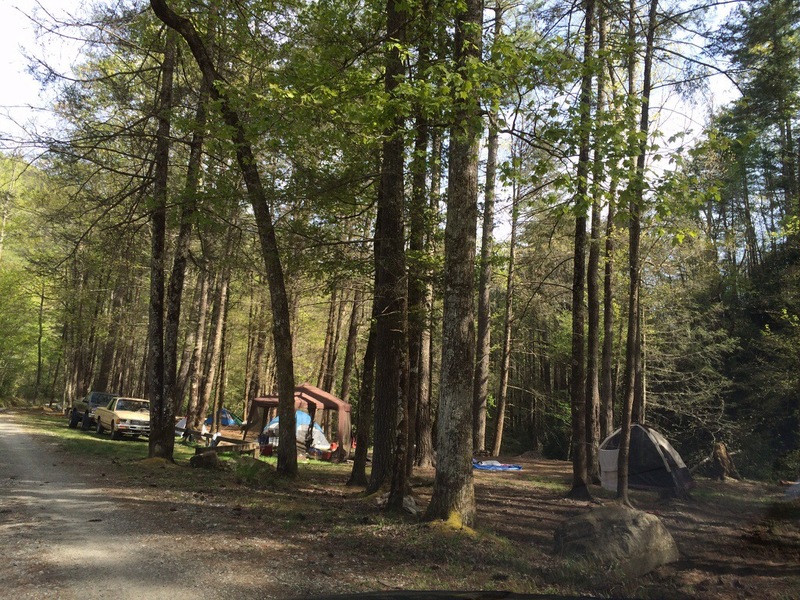 It is also 3 miles north of the Steele Creek Campground exit. NC 181 is marked for every mile. FR 228 will be on the left side and has the appearance of a driveway. If you see the green mile post for 17, you just passed it…very easy to do. Once on the road, like I said, it is very narrow and long. It is not made for 2 way travel, but I did have to share this road about 5 times going in and 3 coming out. Go slow and be careful, the mountain drops sharply in some parts just off this road. That said, the road itself is in good condition. I was surprised when I came upon a creek that I had to drive through. 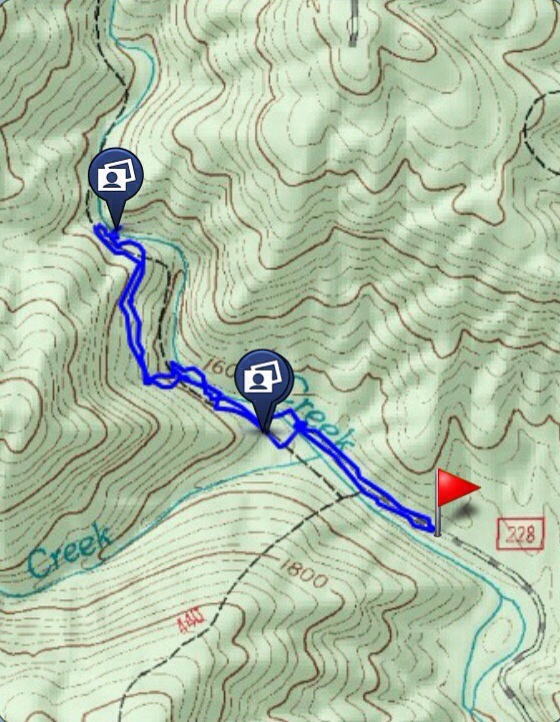 Yes…a creek to ford…..in my Honda Accord! This is NOT..one of the things I look for when searching for waterfalls to visit. It is small however, shallow and it crosses a concrete slab. It’s nothing really more than driving on the street in a rain storm. 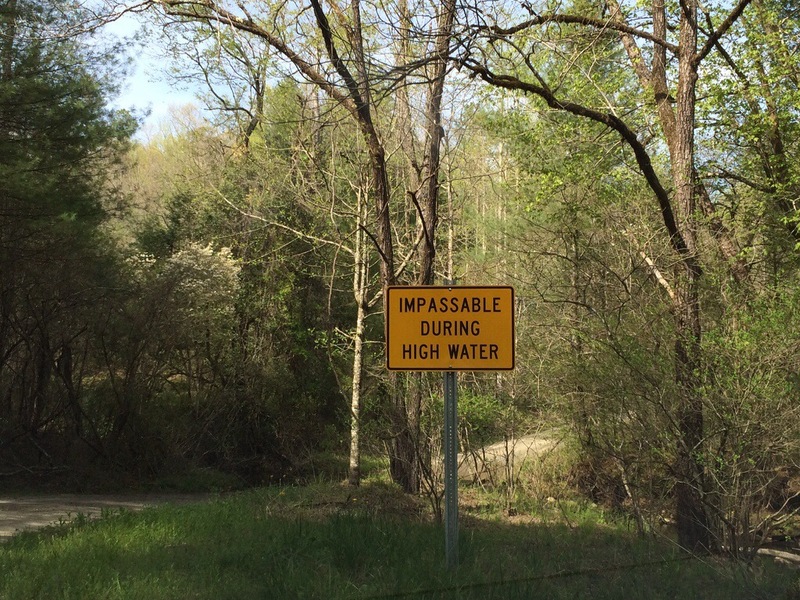 I wouldn’t advise this though in high water as the sign indicates. 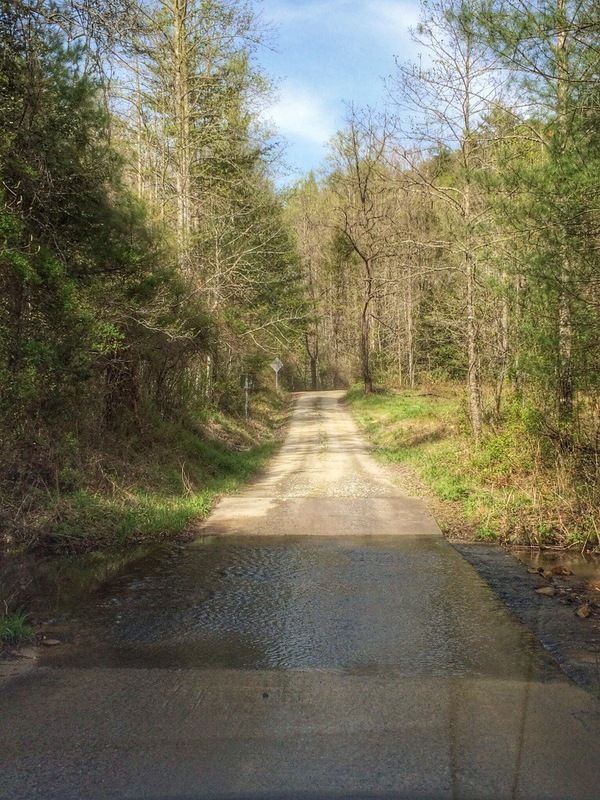 After some more dirt road driving, Steels Creek appears. 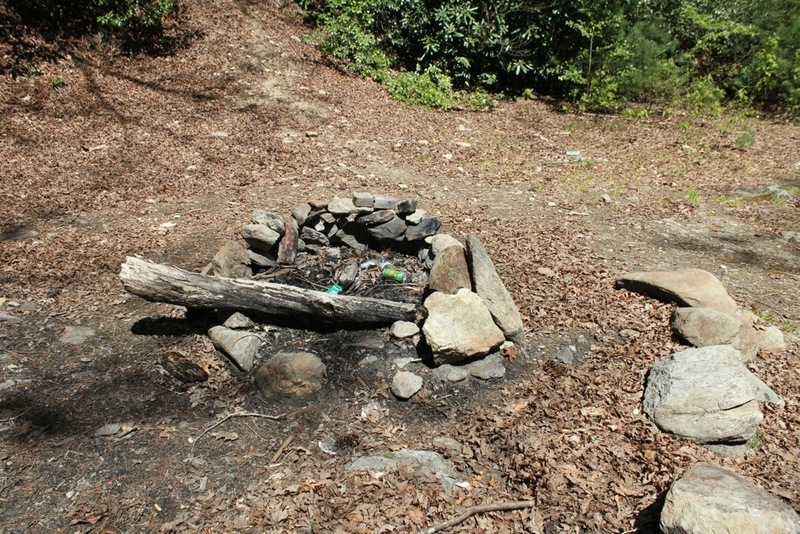 There are many, primitive campsites along this last section of the dirt road. Don’t look for bathrooms, showers, or anything else convenient here. If you have all your own gear and looking for a super place to camp out, this could be a great discovery. 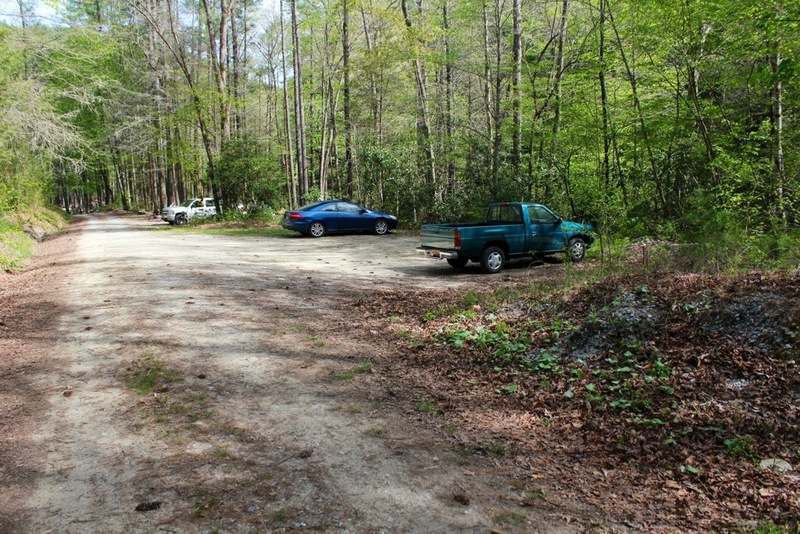 At the end of the campsites, the road dead ends and there is a small parking area. The trail continues where the road ends, and this is where the fun begins. The trail starts off just like the road ends. It is fairly wide here with rocks now sticking out, it is obvious that at some point in time, that this was actually a route to somewhere that people used to travel. 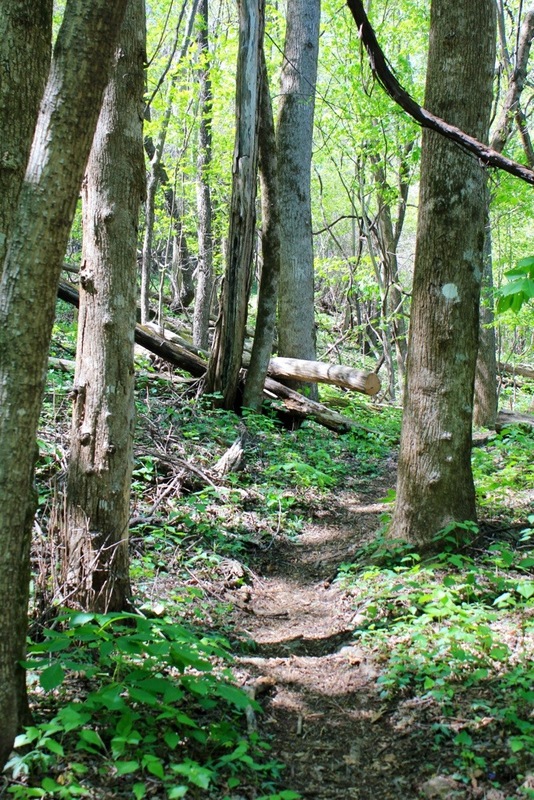 Like many other roads that are no longer used, they have become the backbone of some wonderful hiking trails. I am very thankful for their existence and glad that we are putting them to good use. 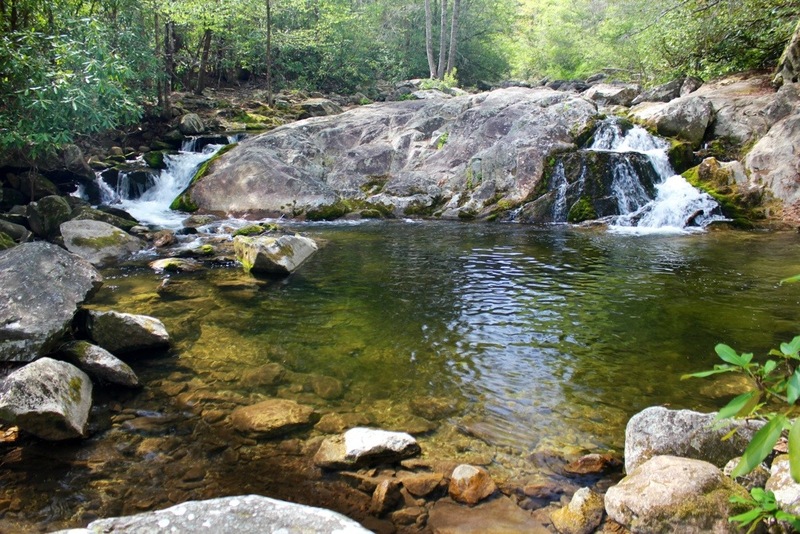 This one, after a short flat walk that passes a nice campfire spot, leads to a small cascade at Steels Creek that must be crossed. This part is a little tricky. 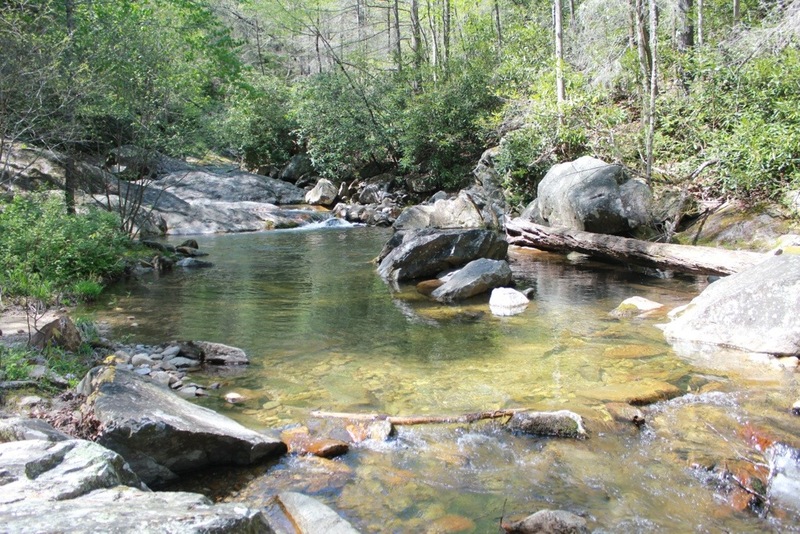 The entire time, Steels Creek has been on the left, and it is time now to cross and have the creek on your right. 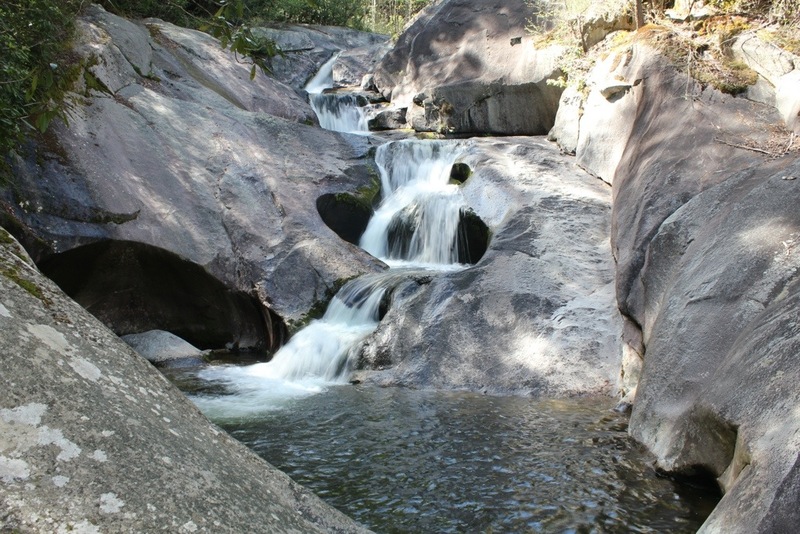 At the top of the cascades, a few boulders must be maneuvered around, as the crossing area is above the cascade. 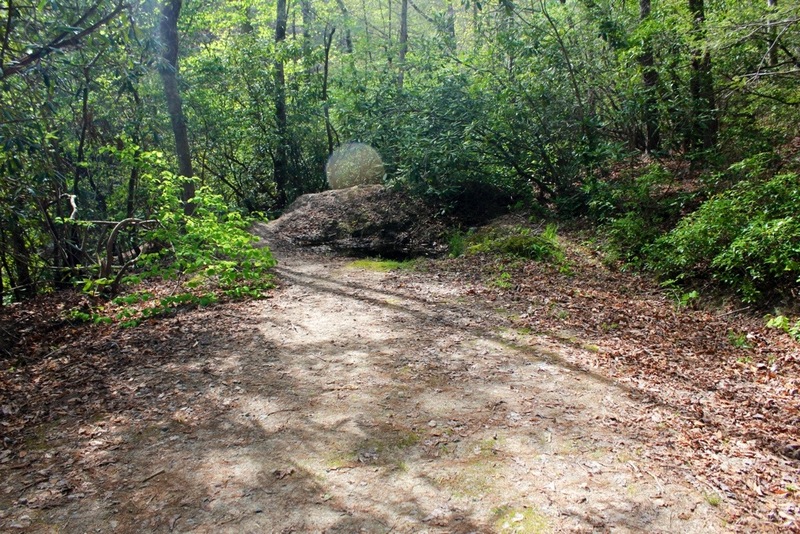 There are plenty of dry rocks to cross here, just be careful and choose your route wisely. 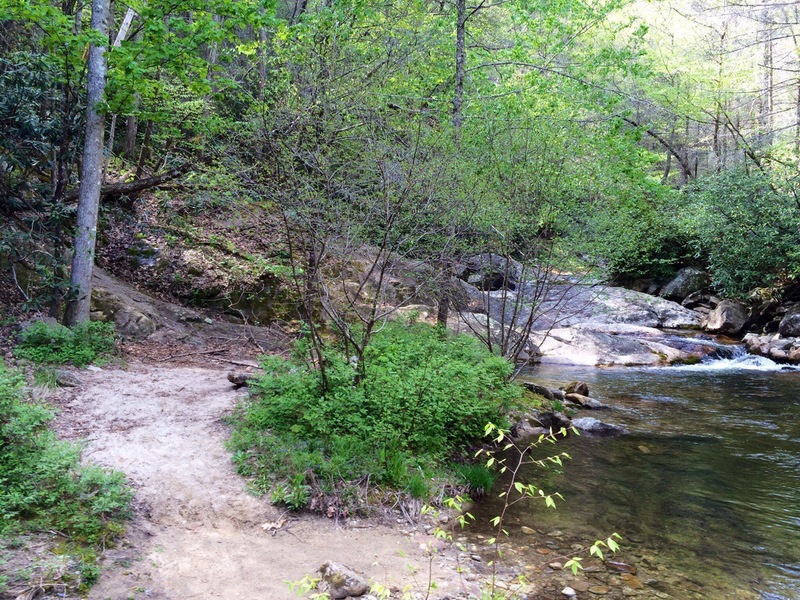 A hiking stick or pole comes in handy when crossing streams. Once across , pick the trail back up. 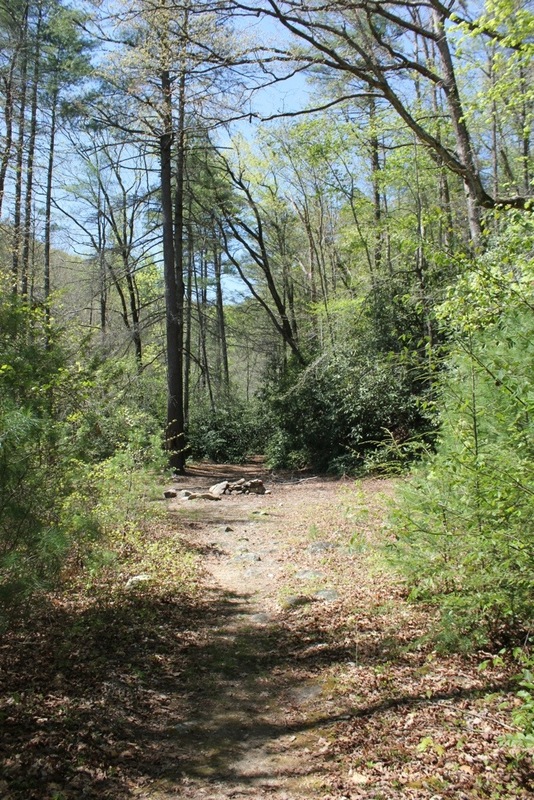 In a short distance, the trail ends in a junction with the Mountains To Sea Trail, marked clearly by the white circles on the tree. Make a right here and continue heading upstream. 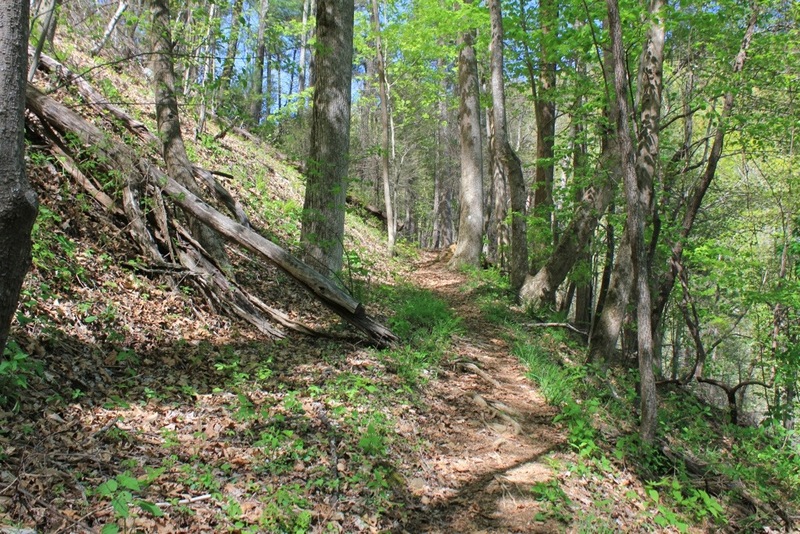 The remainder of the hike will follow this trail. The MST goes up and down a bit then decisively down, back to creek level. It treks the creek level a bit before coming to the scene shown in the last picture. This my friends is decision time. We have now reached the bottom of the gorge that this stream cuts it’s way through. 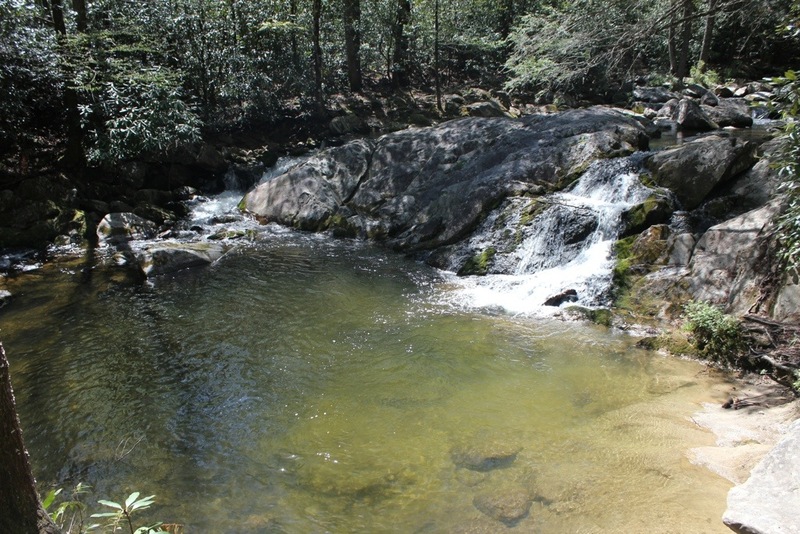 The waterfall on Steels Creek is about 70 feet high total, with a number of smaller drops and one large one at the bottom. At this point, the MST turns 90 degrees left and goes almost straight up, a good ways. 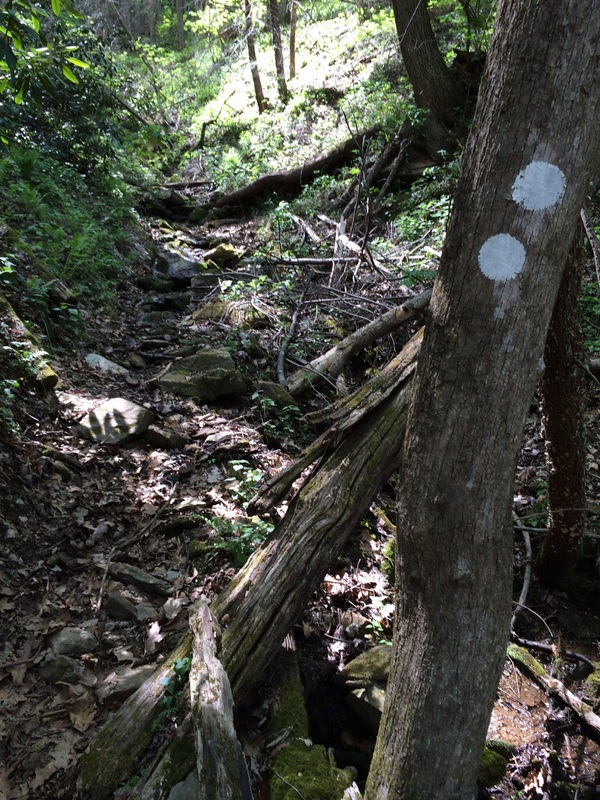 If you want to see the waterfall from the bottom, do not follow the trail here. 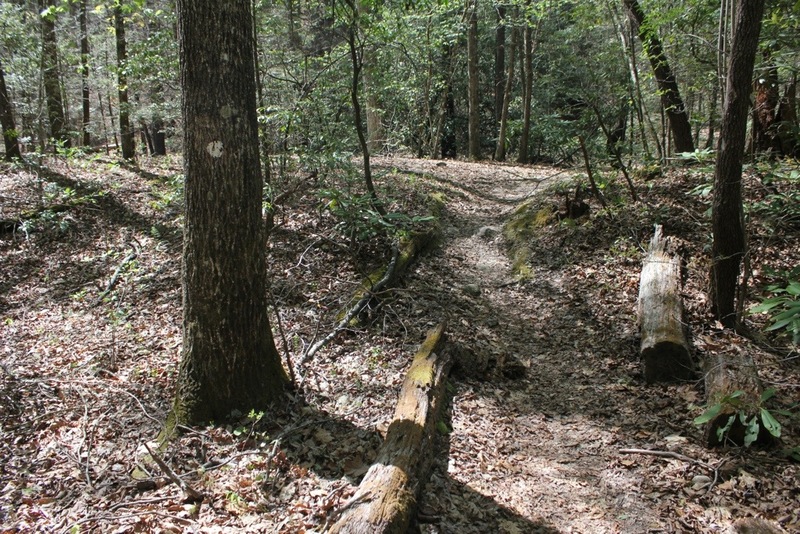 Instead, you would need to walk along side the creek and in it some sections..through it, as there is no trail to the base. 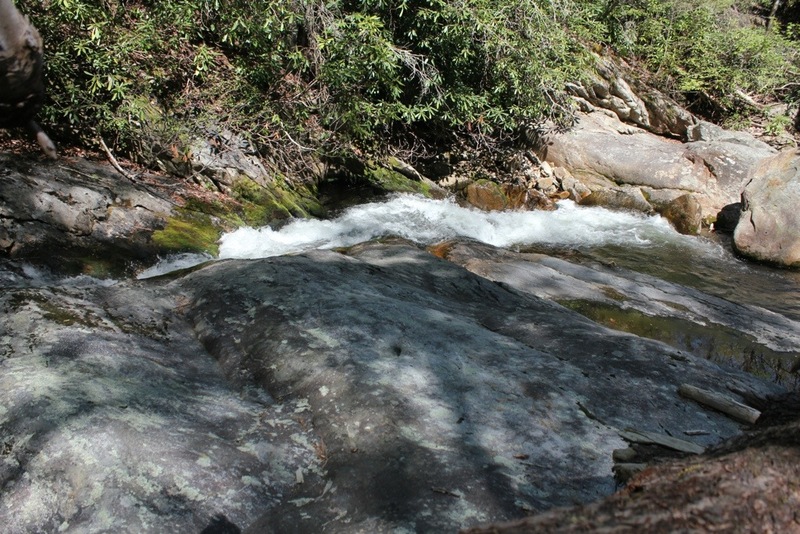 It is simply scrambling and creek wading to the view. This view looks good in the photos I have seen. BUT… If you do this , you will not see the upper section. From the bottom, the MST is way, way above the creek and to see the upper section would require a lot of work back tracking then going up. I chose to stay on the MST. This was my first trip here and I wasn’t up for an extreme adventure. The MST goes up a ravine, eventually turns right, crosses it and keeps going above Steels Creek to a point where you can eventually see the waterfall way below. 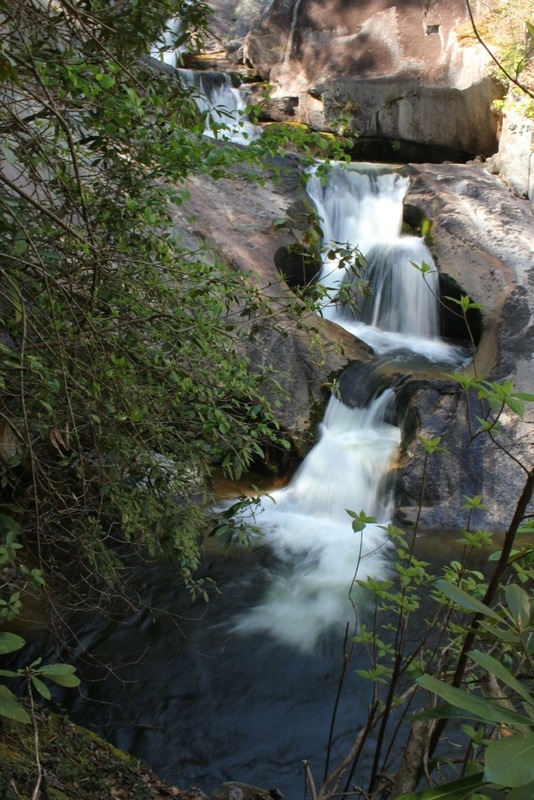 It is easy to know that you have reached the waterfall from the rushing water sounds, and the views through the trees. However, the view of the waterfall on the trail is not good. This certainly wasn’t the view that I hiked this hilly terrain for. There is a scramble path that leads from the MST down to and out on some rocks that provides an excellent view of the upper section. 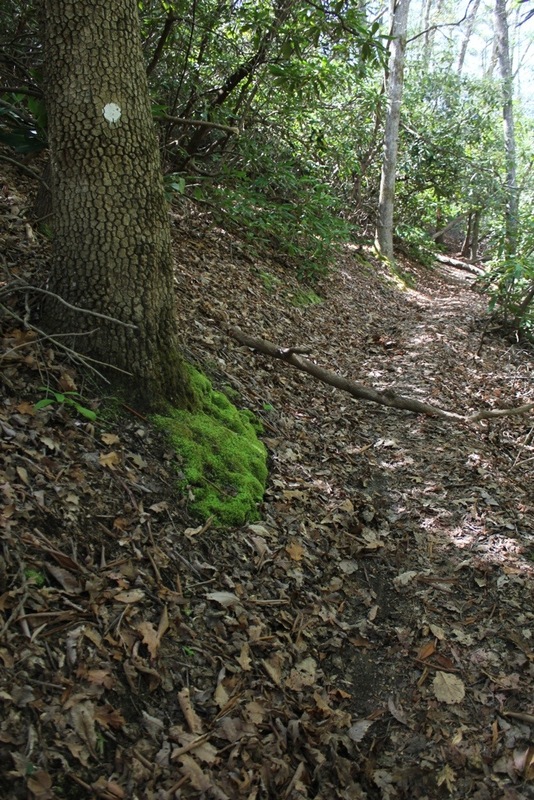 I warn you that it is steep, but plenty of places for sure footing and trees to hold on to make it approachable. The first view was gorgeous…but still somewhat tree blocked. 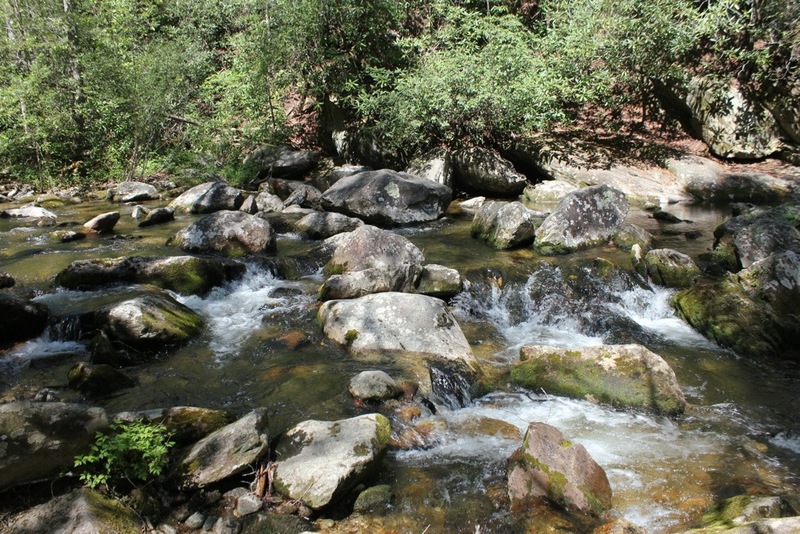 For those that want a better view…like me, the rock slopes somewhat downwards, into the creek . 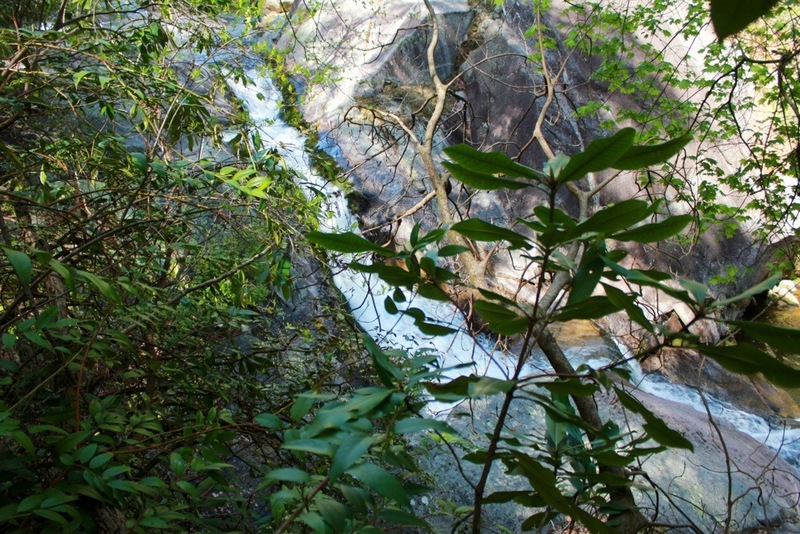 Just a little further down it is the perfect view of the upper half of the Waterfall on Steels Creek. The only problem now is that the rock was about 90% wet. 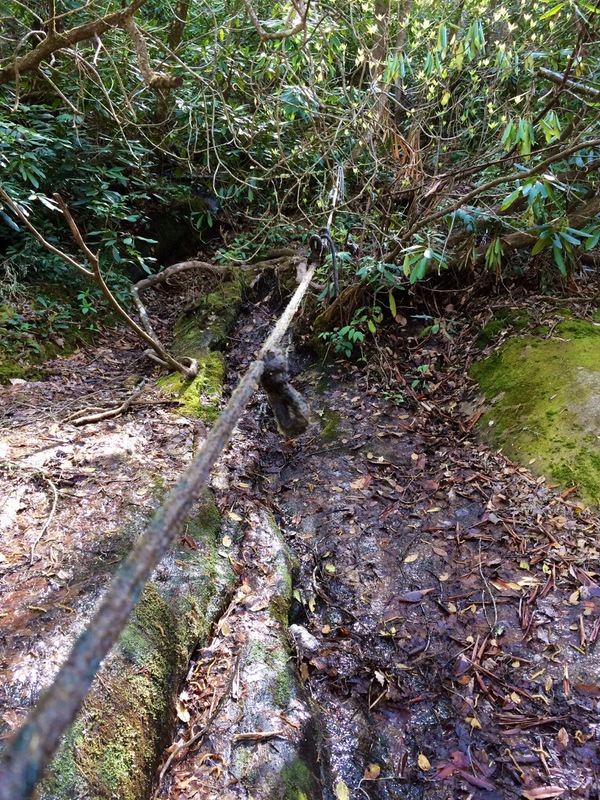 Thankfully, someone has tied some rope to a tree here, that allowed me to safely and securely inch my way down to the spot for me to be in the middle if the falls. Sitting in this spot, the potholes created by the stream are remarkable. 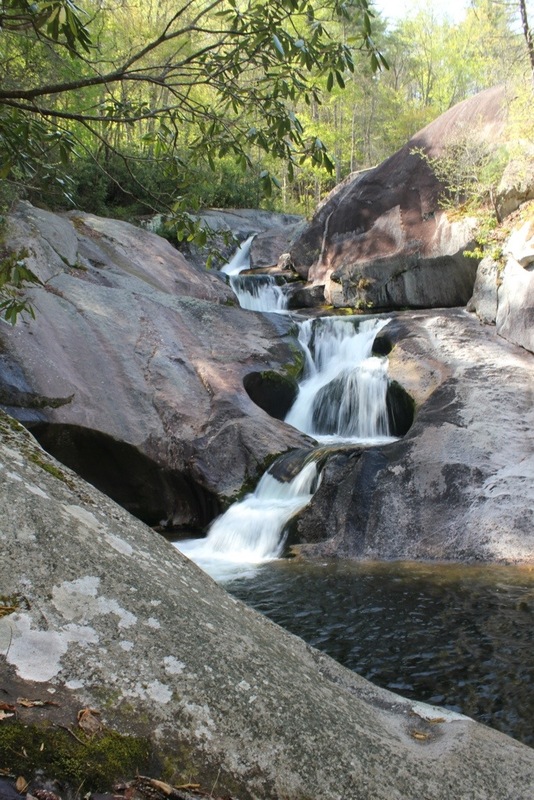 It is also a good feeling, seeing one of NC’s special places that few see due to the remoteness of it. It’s only a few miles from the Blue Ridge Parkway but feels worlds away. This hike was a total of 2 miles round trip. 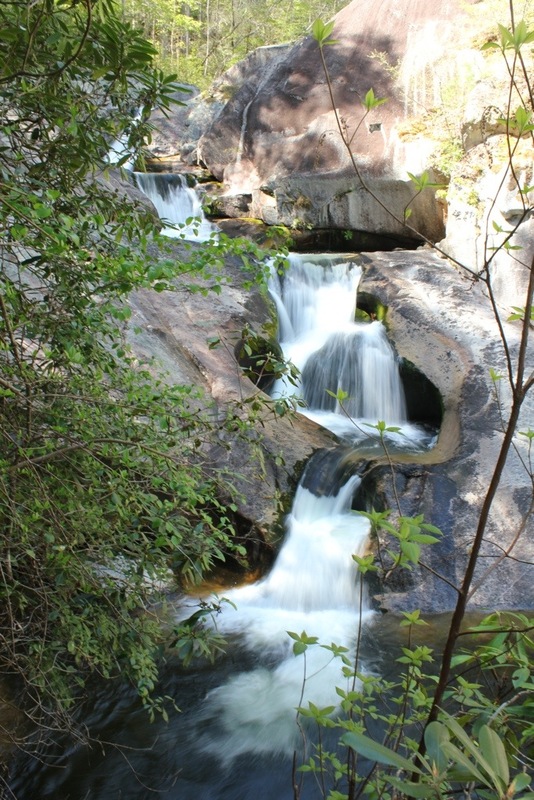 The next time I hike here, I will take the bottom route and focus on the lower falls . Here are some short videos to better display what I was looking at. Great resource. Thanks for taking the time to travel up to the falls. Last summer, a few gfriends and i stumbled on Steel Creek. We went as far as we could, but did not venture up into the gorge. 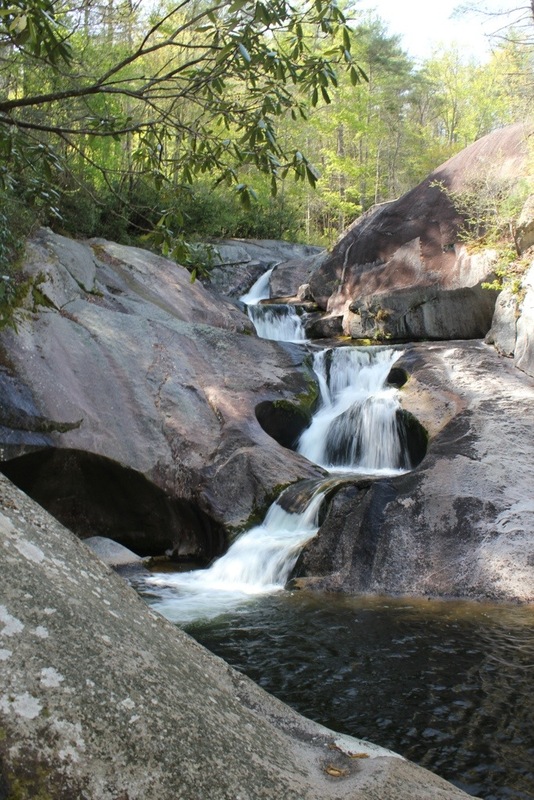 I spend a good amount of time in WNC and this gorge has caught my attention. I am looking to plan a trip up during a dry spell this summer. I was able to find a blog that details the gorge from parking to the upper falls. Great pictures of this amazing place!